After the end of 2nd match between Punjab and Delhi, it was now time for Kolkata and Bangalore. The match was being held in the legendary ground Eden Gardens, in Kolkata at 8pm. The toss was won by KKR and chose to field first. The opening partners of Banaglore were Quinton de Kock and Brendon McCullum. In the first over only McCullum crossed 9000 runs after this achievement he became the second player to get to the place after Chris Gayle. In the second over Quinton de Kock got out by Piyush Chawla. The score was 18/1. By the end of 4rd over McCullum was at 21 and Virat Kohli scored 9. In the 8th over Sunil Naraine got the wicket of MaCcullum and the total score was 63/2. In the 10th over AB de Villers hit back to back sixes. Virat Kohli is getting in the form and taking a bit of time to settle. 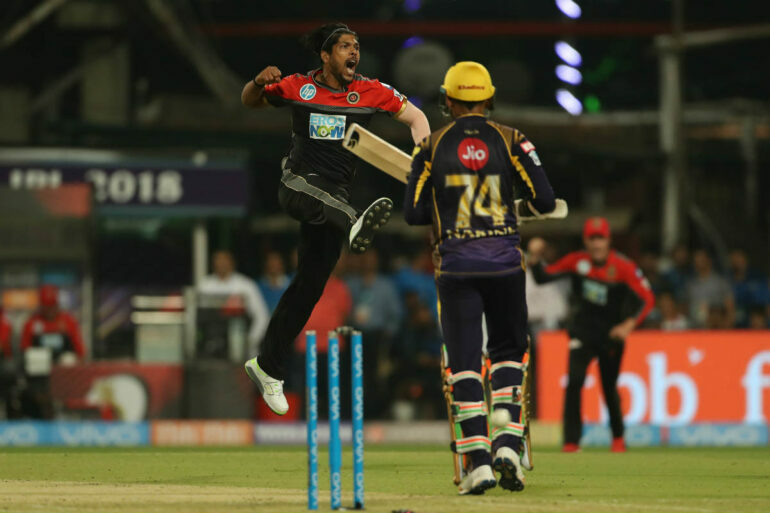 The 11th over was also a good over for RCB as they scored 14 runs in Sunil Narine’s over. The partnership of Virat Kohli and AB de Villiers reached 50 runs. In the 14th over AB de Villiers got out at 44 and the scoreboard was 127/3. In the same over Virat Kohli also got out at 31 runs. In the 17th over RCB crossed 150 runs. In the 18th over again a fall of wicket was seen which changed the scoreboard to 154/5. By the end of 20 overs the score of RCB was 176/7. The opening partners of KKR are Sunil Narine and Chris Lynn. In the first over Sunil hits 2 boundaries. In the second over, Chris Lynn gets out by Chris Woakers and the score becomes 16/1. The 4 over was a big hit for the Knight Riders as Sunil hits two fours and two sixes taking the score to 46/1. By the end of 4th over KKR crossed 50 runs. In the beginning of the 5th over Narine got his half century completed. And the team total was 65/1. In the 2nd ball of fifth over Narine got out at 50 runs in 19 balls. 7th over was full of action as there was 10 runs coming for KKR as well as a wicket for the RCB. By the start of the 10th over KKR crossed 100 runs. There was a stable partnership of 55 runs between Dinesh Kartik and Nitish Rana. In the beginning of the 16th over KKR team total crossed 150 up. In the 17th over 15 runs were given by Umesh Yadav. And KKR reached a score of 162/5. By the end of 18th over KKR won the match.